I had the unique chance to spend Thanksgiving at Disneyland several years ago. My family is pretty traditional when it comes to Thanksgiving: cornucopia, pumpkins, pilgrim rats (don't ask). But, a few years back, we decided to forgo all tradition and spend Thanksgiving at the Happiest Place on Earth! What's that? You want tips? I thought you'd never ask! Decor: Let's get this out of the way straight off the bat: Disneyland does not go out of its way to decorate for Thanksgiving. It is in full-on holiday mode. The fall decor is gone. That Thanksgiving vibe is nowhere to be found. But, holiday time at Disneyland is fantastic! So, I wouldn't be too bummed about that. Crowds: It's crowded. It's always crowded. Monday and Tuesday of Thanksgiving week were average. Wednesday and Friday were packed. Actual Thanksgiving day was somewhere in between. Schools are on vacation. Businesses are closed. Expect crowds. There's a Pinterest post out there saying that the park is empty on Thanksgiving. Don't you believe it! Food: Though it totally bummed out my mom, my hubby and I had no interest in sitting on a bench and eating a giant turkey leg for Thanksgiving dinner. 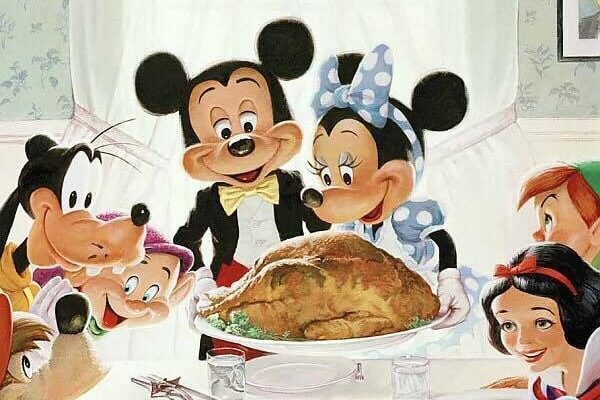 There are several restaurants in the park that offer a Thanksgiving-style dinner in addition to their regular menu. For a full list, click here. But, we were hoping for the full-on buffet experience, so we knew the hotels were the place to go. The main event, dining-wise is at the Grand Ballroom of the Disneyland Hotel. But, we didn't have reservations. And it's pricey...really pricey...like $80 a person pricey. So, we went with the least pricey hotel option: the PCH Grill. We got there just before their dinner buffet was starting, around 4:00, maybe a touch earlier. I'm not going to lie, they looked at us like we were crazy, not having reservations and put us on a "we can't guarantee anything" standby list. We decided to give it one hour. But they watched us sit there, knew the place was virtually empty, and called us our name after about 10 minutes. "Happy Thanksgiving! Let's go eat!" There were tons of options. (Even for me, the vegetarian!) Classics and modern spins on classics. My favorite? I want to be a foodie and say the pumpkin ravioli (which were super tasty), but in reality, it was the mini pumpkin pies! The hubby and I may have snuck a couple of those out in a baggie to have as the next morning's breakfast. Shh...don't tell. They were amazing! Overall? It was a really fun memory and something that I would absolutely do again! It didn't have that Thanksgiving feel that I love. And, I certainly wouldn't do it every year. But, we made a lot of great memories, and ate a lot of great food. Especially the mini pumpkin pies. Trust me on this one.